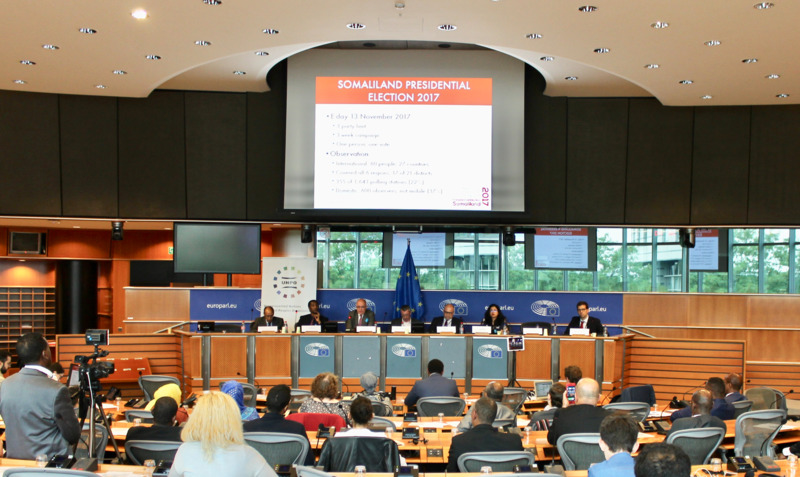 On 22 May 2018, in coordination with Luxemburgish MEP Frank Engel, UNPO held a conference focussing on the 2017 Somaliland Presidential Election at the European Parliament in Brussels. Among discussions on the recent election, the topic of Somaliland’s de facto statehood and its challenges in engaging with the international community was also debated. The event was planned to present the international Electoral Observation Mission (EOM)’s Report, which was officially released in London in March 2018. Among the panellists were Somaliland’s Minister of Planning and National Development, Dr Michael Walls, Chief Observer of the 2017 EOM, Patrick Simonnet, Head of Division for the Horn of Africa at the European External Action Service (EEAS), as well as host MEP Frank Engel, joined by MEP James Carver. Also present on the panel was Amb. Mohamoud Daar, Somaliland Representative in Brussels, as well as two UNPO staff members who served as short-term observers to Somaliland’s elections, Tommaso Nodari and Fernando Burgés. Somaliland’s electoral exercises have been widely considered to be a key indicator of the maturity of its institutions, in stark contrast to the weakness of Mogadishu’s political institutions and control of its territory, but also to the general situation in the wider Horn of Africa. The latest Presidential election, which took place throughout the country on 16 November 2017, saw the victory of Kulmiye candidate Muse Bihi Abdi, closely followed by Waddani party’s Abdirahman Mohamed Abdullahi. The third candidate was Faysal Ali Warabe of the Justice and Welfare party (UCID). The conference was opened by the host, Mr Frank Engel MEP (EPP), who spoke about the country’s lack of recognition. Mr Engel referred to the poor excuses that different actors in the international community bring up to justify their inactivity. In particular, he countered the narrative of “Pandora’s box” and of the fear of a so-called Balkanisation that would lead to the fragmentation of the whole continent. According to Mr Engel these arguments overlook Somaliland’s past as a recognised state and its existence as a British colony completely separate from Italy-controlled Somalia. James Carver MEP, a long-time supporter of the country, was quick to highlight the examples we should take from Somaliland, particularly on the issue of refugees. Speaking about sovereignty, he referred to this issue among many that prove, in actions rather than in words, Somaliland’s worthiness of statehood. The Minister of Planning and National Development of the Republic of Somaliland, the Hon. Cawale Ibrahim Shirwac, attended the meeting to represent the government. In thanking the organisers and audience for their support of his country’s cause, he called for more attention and help from the international community, especially in light of the natural disasters that Somaliland has been facing over the past few years. He later referred to the recognition of South Sudan as an example of the contradictions in which the international community falls in these matters. Dr Michael Walls of UCL London led the audience through the process that culminated with the landmark 2017 Presidential Election, and presented the EOM’s report, giving a number of facts and numbers as an example of the health of the country’s democracy. In light of his multiple experiences as an observer and chief observer, Dr Walls explained how the one that took place in November 2017 was not an exception, as since the turn of the millennia, Somaliland has experienced several rounds of Presidential, Parliamentary and local elections. Although some frailties and minor irregularities were highlighted by the observers, these were not sufficient to raise doubts about the correctness of the final outcome. Mr Patrick Simonnet, speaking on behalf of the EEAS, outlined the EU’s role as one of the major donors to Somaliland in terms of development aid, with some 150 million euros touted as an estimate. He expressed reservations however, over the current human rights and conflict situation, referring to recent cases of arrests and of skirmishes on the border with Puntland, as well as expressing fears of Somaliland becoming a proxy for outside interests. Quickly touching upon the issue of recognition, the EEAS official highlighted how this has to go through the African Union’s approval before the EU can do anything and how in any case this would be a Member State competency. During the conference Tommaso Nodari shared the perspective of an international observer during the election. His experience was very positive and he was impressed by the optimistic attitude of the population and enthusiasm for statehood shown even by common people. Tommaso also elaborated on the perceivable involvement of women in the elections, especially referring to polling stations staff and chairs and to the novelty of Somaliland being the first nation to use an iris recognition-based biometric voting system. Fernando Burgés, who spoke on behalf of UNPO, elaborated on the disadvantages Somaliland faces from exclusion by the international community. Such disadvantages include lack of access to monetary loans such as through the World Bank and limitations to direct humanitarian action. He also touched upon the seeming hypocrisy occurring as the African Union fears that recognising Somaliland would set a dangerous precedent, yet the AU had previously sent a fact-finding mission in 2005 regarding Somaliland’s sovereignty claims, and had established that Somaliland’s case should be considered exceptional. The African Union deems that the timing is not appropriate for Somaliland’s recognition, yet the creation of South Sudan in 2011 shows that self-determination is very much as possibility in the continent. This conference was enriched by the presence of members of the opposition party Waddani, led by Fatima Ibrahim, a politician who participated with questions and an intervention following the panellists’ speeches. Other questions from the audience touched upon the fundamental issue of humanitarian aid. For one, the lack of statehood means Somaliland has to use ‘’unconventional’’ sources of humanitarian aid that makes both access for Somalilanders and tracking for donors much more complicated. The EU is the most relevant actor in such cases and if it is to conduct a successful, balanced development policy, Somaliland´s statehood can only help. The UNPO continues to believe that Somaliland has demonstrated enough democratic maturity and political necessity for them to gain access to recognised statehood by the international community, and the UNPO will continue to ask the EU and its Member States to support Somaliland, further encourage its democracy and, hopefully, one day welcome it among its peers as a fully recognized country.